A firm safeguarding of national sovereignty and border security in the new era requires joint efforts of all Party, people and military. As for the Border Guard, its Party executive committee and High Command have focused on leading and directing all fields, in which the building of a strong all-people’s border guard posture is a top priority. Thorough grasp of the Party and State’s guidelines and policies, first and foremost those of the Central Military Commission, the Ministry of National Defence, and the Party executive committee of the Border Guard, on military and defence tasks, the Border Guard Command has brought into play its leading role in controlling and protecting national border security; performing all missions of border guard; and building the border guard posture in association with the all-people’s defence posture and the people’s security posture. The “people’s hearts and mind posture” in the border areas and political systems at grass-root levels so far have been improved; the armed forces have become comprehensively strong; the placement and employment of weapons, equipment, logistics, and engineering have been conducted, fulfilling the stated requirements. The movement dubbed “All-people’s participation in the defence of territorial sovereignty and national border security in the new era” is implemented inclusively and effectively, enabling people to believe in the Party’s guidelines and the State’s policies and law, to actively enhance economic and cultural development, to establish a new prosperous and happy life, and to take part in the control and defence of national border. First, enhancing the quality of propagation and education of people in border areas. This is an important approach and basic task of the Border Guard, which is indispensable to the building of the all-people’s border guard posture. The propagation and education focus on shedding light on Ho Chi Minh’s thought, the Party’s guidelines and the State’s policies and law, especially Resolution of the 12th National Party Congress, the 8th Central Resolution (11th tenure) on national defence strategy in the new era, Resolution of the 10th Military Party Congress regarding sovereignty and protection of sovereignty and security of national borders; Law on the National Defence, Law on the National Borders, decrees and agreements on border concluded between the Government of Vietnam and relevant governments, and so on. In addition, the movement serves to clarify the significance and content of the all-people’s border guard posture and the hostile forces’ plot to implement their strategy of “peaceful evolution” and incite “self-evolution” and “self-transformation”. During this process, it is necessary to bring into play the role of organizations and forces, means of communication and the system of cultural establishments; closely combine regular education and propaganda with themed ones, and so on. Forms and methods of propagation need to suit characteristics, awareness, customs and habits of every subject. Special propagation, border guard diplomacy, people-to-people exchange, etc., should be promoted, thus making cadres, party members, first and foremost core leaders of border guard units and people, aware that the all-people’s border guard posture is the way to organize and deploy forces and equipment. In this organizational structure, the Border Guard plays the leading role, in close association with other armed forces and people in each direction under a unified plan to exploit the combined strength to control, protect independence, sovereignty, unification, territorial integrity, and national border security in both peacetime and wartime. Second, proactive participation in the building of comprehensively strong political systems at the grassroots level. Currently, 270 out of 5,000 villages in the border areas are without party members. Nearly 1,000 villages are incapable of establishing party cells. Consequently, Party executive committees and commanders of the Border Guard at all levels have led officers and soldiers to stick to localities, thoroughly grasp the situation and operational quality of basic political system, and proactively advise Party executive committees and local authorities to work out policies and measures to reinforce, staff and improve the operational quality of party organs, authorities and unions. It is important to provide knowledge of national defence and security for subjects, especially those of high prestige, self-defence force, reserve, village cadres, and union leaders; and cultivate new party members. On the basis of achievements gained over the past few years, the Border Guard has reviewed, staffed, and trained in order to improve the quality of cadres dispatched to border communes; and worked with Party executive committees and authorities to bring into play their roles in giving advice and participating in the establishment and consolidation of political system at the grassroots levels. The Border Guard and its Party executive committees will continue to advise, coordinate, and implement the Directive No. 01/CT-TTg dated January 1st 2015, on the “organization of all people’s participation in the defence of territorial sovereignty and national border security in the new era,” the Project to “coordinate with local authorities to open ethnic language classes for officers and non-commissioned officers of the Border Guard working in ethnic populated border areas” and the Project to “dispatch officers and non-commissioned officers of the Border Guard to vital communes in the border areas” once it is approved by the Ministry of National Defence and the Government. Third, active participation in socio-economic development to stabilize and improve people’s living standards in the border areas. Over the 30 years of renewal under the Party’s leadership, in spite of becoming a middle-income country, people’s living standards in over 1,000 border communes still witness a number of difficulties, in which over 400 communes are in extreme difficulty. Traffic, education, healthcare, culture, etc., remain underdeveloped. The intellectual standard of people is still low with backward customs and habits. Uncontrolled migration, smuggling, trade frauds, illegal possession and use of drug, etc., have not been resolved thoroughly. Therefore, socio-economic development, stabilization and improvement of people’s living standards in the border areas represent an enduring fundamental measure and prerequisite to build a strong all-people’s border guard posture. 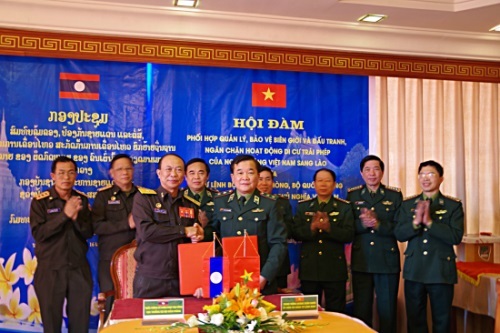 In order to fulfill this goal, the Border Guard has advised Party executive committees and local authorities on measures to establish and combine socioeconomic development with defence and security; invest in socioeconomic development and enhance the living standards of ethnic groups in border areas. Moreover, it has actively advised local authorities and people on planning socioeconomic development, improving people’s living and intellectual standards and been directly involved in helping local people realize their socio-economic development models. Border posts have run well several movements such as “Housing for Poor People in the Border and Islands,” “Cow for Poor People in the Border Areas,” “Houses of Gratitude,” etc., in recent years. They have also opened classes to eradicate illiteracy, realized the policy of “eating, living, working, and speaking ethnic languages together,” “talking for the sake of people’s comprehension, acting for the sake of people’s faith,” and helped people change their farming habits, shift animal breeding and crops, improve people’s intellectual standard, and firmly preserve socio-political stability. Border posts have carried out models of helping people with socioeconomic development, produced by the Border Guard, development of household economics, and hunger eradication and poverty alleviation. Furthermore, the border posts have also provided people with free medical check-ups and medicine; coordinated with local medical facilities to prevent and control epidemics and pandemics and conduct the expanded program on immunization and other medical activities in the border areas; opened classes of mercy, universalized primary education; and implemented effectively programs including “Concretization of Floors,” “Providing School Shoes for Needy Students,” and so on. Those are practical and effective measures that need to be expanded and exploited. In addition, the Border Guard has coordinated with Party executive committees and authorities at various levels to propagandize and support people in their switch from a nomadic to a settled way of life and agriculture, in line with the motto of: “spreading the population out to preserve land” and “encouraging people to settle down the in border areas.” At the same time, the Border Guard has taken part in the construction and development of infrastructure, especially road system in mountainous areas, border patrolling routes, medical, educational and cultural establishments, and trading services, ensuring needed conditions for people to stabilize their life and stick to their villages, terminate “hunger, illiteracy and lack of medicines and information, etc.”, alleviate poverty, address difficulties in socioeconomic infrastructure, make contributions to political stability, preserve and bring into play the cultural identity of Vietnam, and build borders of peace and friendship. Fourth, building and placement of armed forces, combat support infrastructure, etc., to meet the requirements of controlling and defending borders in any circumstance. Establishment of all-people’s border guard posture aims to bring into play the combined strength of the whole people in controlling and safeguarding sovereignty and border security in the motto, “Each citizen in the borders represents a frontier soldier.” Accordingly, each localities in the border areas must identify clearly both their short-term and long-term objectives in building concrete border guard posture, in line with the requirements of controlling and defending borders in their areas and capability of each locality. Among these measures, the establishment of the “people’s heart and mind posture” and the “people’s heart and mind border” is a decisive matter. The organization, deployment and employment of the armed forces in the border areas must satisfy the need of making Military and Security Forces, Border Guard, Militia and Self-Defence Forces, etc., comprehensively strong, first and foremost in political aspect; wholeheartedly loyal to the Party, Fatherland and people; good at professional knowledge; skillful at techniques, tactics, etc., enabling them to play the core role in the movement to fight against the enemy, combat crime, and protect independence, sovereignty, unification, territorial integrity, and national border security. Its is necessary to concentrate on making the customs and quarantine forces, culture and healthcare services strong, capable of fulfilling their missions. The deployment and employment of those forces in the all-people’s border guard posture must be in conformity with functions and tasks of each force so as to create an uninterrupted, thorny and strong all-people’s border guard posture, enabling the Border Guard to fulfill their tasks in peacetime and defence in wartime. Moreover, it is vital to increase investment in infrastructure, weapons and equipment and enhance the effectiveness of border control and defence in any circumstance. Fifth, strengthening leadership and direction in the field of building the all-people’s border guard posture. Building the all-people’s border guard posture is the art of organization, placement and employment of forces and an element in the art of controlling and safeguarding the national border security. The Border Guard plays the leading role in conducting operations to defend the borders, making contributions to complete successfully the two strategic tasks, namely construction and defence of the Fatherland. The leadership and instruction on the establishment of the all-people’s border guard posture constitute a political work of the Party and State, first and foremost the direct responsibility of Party executive committees and local authorities in the border areas. Strengthening the Party’s leadership and unified command and management of authorities nationwide, in each frontier-line and waters is a principle, ensuring that the all-people’s border guard posture performs the right tasks with desired effect, meeting the requirements of safeguarding sovereignty and national border security in any situation. The all-people’s border guard posture constitutes an element of the all-people’s border guard, which is characterized by inclusive organization and employment of forces and national potential in the border areas and waters according to a strategic intention in order to firmly control and defend sovereignty and national border security; and build borders of peace and friendship on the basis of defence and security strategies. Building a strong all-people’s border guard posture will make concrete contributions to protecting sovereignty and national border security in the new era./.